On the north chancel wall of the church of St Michael at Stowe-Nine-Churches, Northamptonshire is the large monument that commemorates Dr Thomas Turner, an acclaimed academic and churchman who died in 1714. The monument is signed ‘Thos Stayner fecit’. Carved from a variety of marbles, the monument has a large central inscription placed on fringed drapery which is knotted at the upper corners and positioned beneath the cap of a balacchino. Flanking this arrangement are two fluted pilasters with two standing figures at the ends of the composition. The figure on the viewer’s left is that to Dr Turner, while that on the right is Faith who holds a model of a circular church. Above a moulded cornice is a segmental pediment. In the area beneath the curve is the unusual feature of a panel carved with clouds and an eye set within a sunburst. Beneath the main sill are two console brackets with a pair of oval cartouches of arms set on a plain panel. Thomas Turner was born in Bristol in 1645, the younger brother of Francis Turner who became Bishop of Ely. On 6th October 1663 he was admitted to Corpus Christi College Oxford. He graduated with a B.A. degree on 15 March 1665-6 and took his M.A. in 1669. In 1677 he graduated Bachelor of Divinity and in 1683 graduated as Doctor of Divinity. In 1672 he was elected Fellow of Corpus Christi College. He held various clerical posts including being archdeacon of Essex (1680) canon of Ely (1686) canon of St Paul’s London (1682) and Precentor of St Paul’s (1690). The vast majority of his preferments were resigned at or just after his election as President of Corpus Christi College on 13th March 1687. His election as President took place only one week after the death of his predecessor, Robert Newlyn, possibly to prevent any interference from James II. Turner died on 29th April 1714 and is buried in the chapel of Corpus Christi College but the obvious question is why is he commemorated by a monument at Stowe-Nine-Churches? 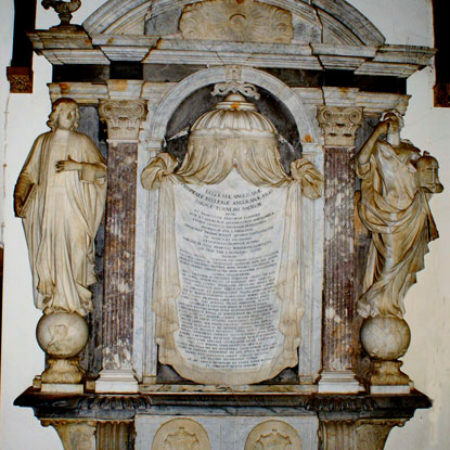 The lengthy inscription mainly concerns the disposal of his property, but his executors bought an estate at Stowe, the income of which would have helped provide further funds for the relief of the widows and orphans of poor clergymen who were the main beneficiaries of his will. He was also very generous towards his college, as in 1706 he paid for the erection of what is now called the Fellows’ buildings, the design being attributed to Dean Henry Aldrich with William Townsend as the contract mason. This work is estimated to have cost £4,000 and Turner is thought to have left an estate worth in total about £20,000. Thomas Stayner (the elder) was born in 1665, apprenticed in 1683 to Michael Todd and became free of the Mason’s Company in 1690. He was elected Master of the Mason’s Company in 1709. As early in his career as 1694 he had two apprentices working under him including his younger brother Anthony, while two of his own sons were also apprenticed to him. Although only nine monuments have been positively identified as by Stayner, he very probably made more which remain to be identified. He employed elements of the baroque in his work and demonstrates at least an understanding of some of the finer points of the style. The Turner monument is certainly one of his most ambitious but what makes the monument unusual is the positioning of the principal figures. That to Turner himself is quite controlled and simply shows him in clerical costume and carrying a book. It is the figure of Faith that is much more in the baroque style, especially her right hand brought up to the face in a dramatic gesture. The treatment of the drapery, particularly the end of the over gown that is gathered under her left hand, is firmly in the baroque tradition as is the head turned away from the spectator. Stayner has also placed the standing figures on spheres that display the constellations, another very unusual feature. The sphere beneath Turner also has his crest on the front while that beneath Faith carries a Bishop’s Mitre. Stayner was quite an ambitious sculptor and the Turner piece is probably his most remarkable. 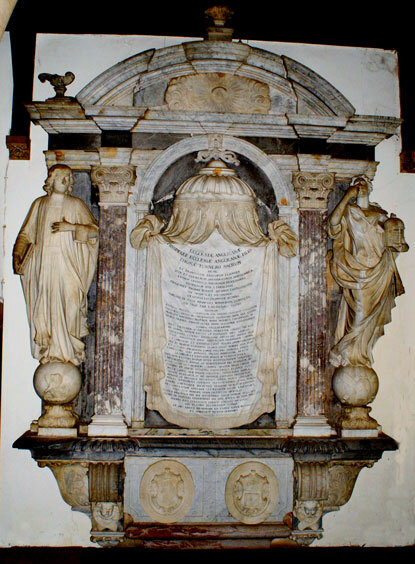 Another of Stayner’s monuments is that at Quainton, Bucks, to Richard Winwood and his wife erected in 1689. This lively monument shows the male figure in armour lying on a mat, the rolled end supporting a cushion on which he rests his head. The body is turned away from that of his wife who reclines on the left elbow and gazes down at him in a pose of melancholy, her interlocked fingers being particularly beautifully rendered. This monument is also unusual in having an engraving of a recumbent skeleton, complete with hour glass under its raised knees, running the length of the tomb chest. Thomas Stayner died in 1733 at West Hampton in Essex. In his will his widow Dorothy was to inherit his house and other property and after her death the estate was to pass to their daughter Mary. Stayner was an important sculptor. Although one of the lesser known mason-sculptors, he was highly imaginative and a contemporary of some of the great names of the period including William and later Edward Stanton, Abraham Storey, Thomas Cartwright, John Bushnell and others and his work ranks amongst the best of the London sculptors operating at the end of the seventeenth and during the early eighteenth centuries.